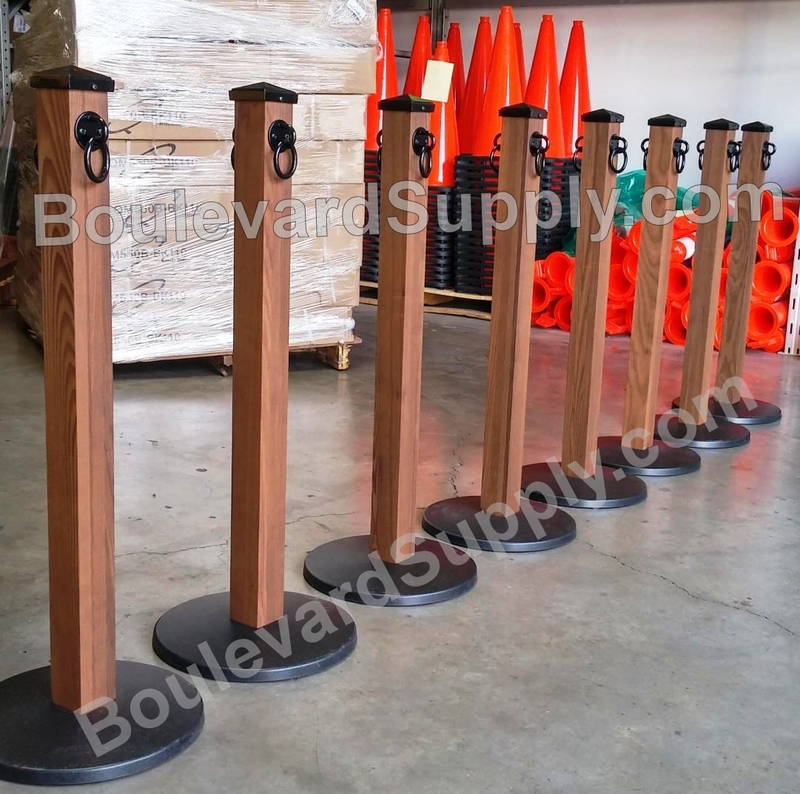 Available are all wood stanchions stanchions and powder coated metal stanchions with a wood grain appearance. 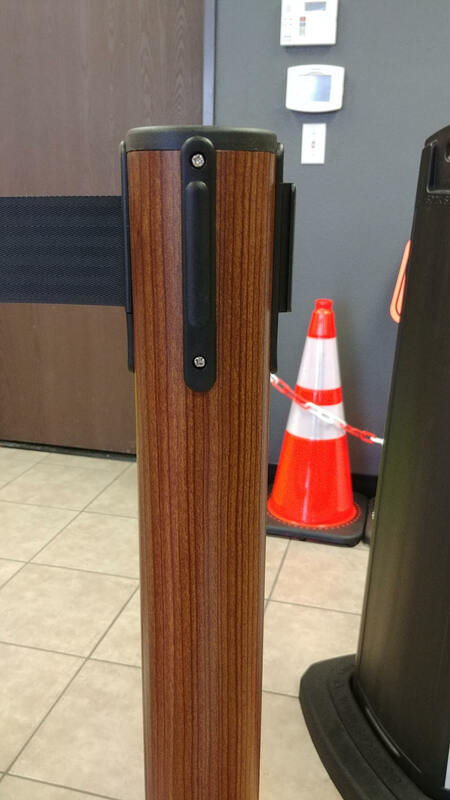 Our metal retractable stanchions can also be wrapped in a wood grain finish of your choosing. The best choice of wood stanchion for outdoor use are wood stanchions from Stanchion Masters. They are built with eco-friendly Thermo hard wood and stainless steel hardware to withstand most climates, weather conditions and natural events. Hurricanes and lava flows not included. The heavy duty cast iron bases are covered with black plastic scuff proof covers. You have your choice of finials. See below. Natural looking braided hemp ropes go great with this wooden stanchion. COLOR: Thermo Ash is naturally brown as shown. Left unsealed or stained, they will patina to a gray over time. Your choice to seal or stain. We do recommend sealing when they will be used in frequently wet conditions. Custom powder coated post cap colors are available at additional cost. Minimum order of (10) stanchions applies. USE: Indoors or Outdoors. Designed for use in sun, rain and snow! 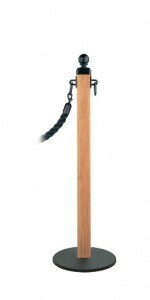 Our most popular choice of wood stanchion for indoor use is the hitching post wood stanchion. It’s a perfect fit for a country style ranch setting, southwestern setting or rustic setting. The 307 Hitching Post from Tensator features a solid oak square post, black cast iron base, black ball finial and black hardware for rope connections. Natural looking braided hemp ropes go great with this wooden stanchion. 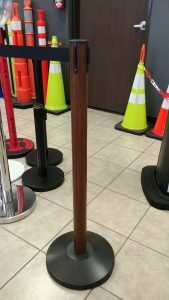 These are three piece solid wood red oak stanchions with an English Oak stain. The ropes attach to a polished chrome or polished brass ring at the 36″ high mark. Who knew retractable stanchions were available in wood? Technically they are not but now our powder coating techniques are so good that you cannot tell the post isn’t real wood until you touch it. 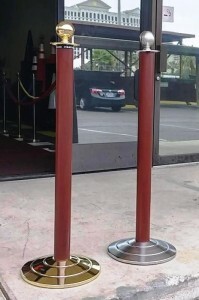 The highly durable powder coated finish also adds life to your retractable belt stanchions which are suitable for outdoor use after powder coating. COLOR CHOICES: Multiple powder coated wood grain finishes available. Light brown, medium and dark browns, walnut, maple, cherry, mahogany and other choices available. 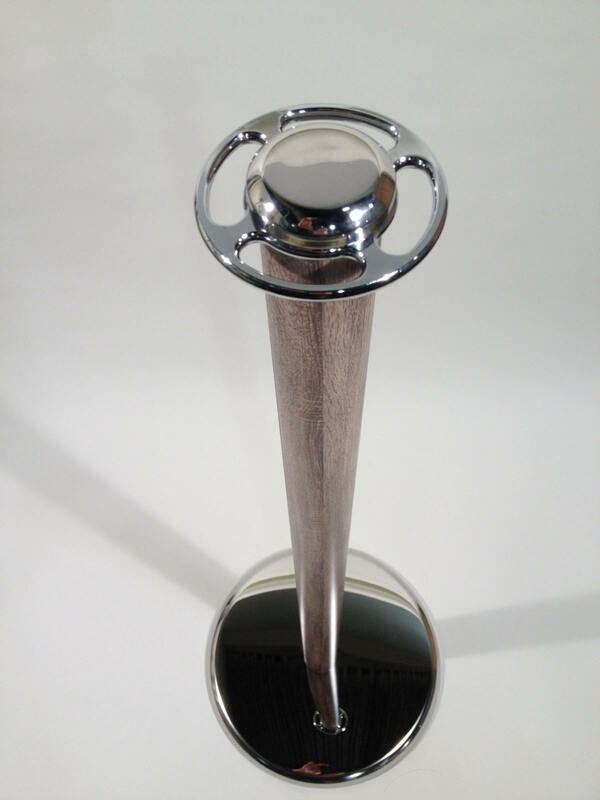 The choices are almost endless when it comes to powder coated custom stanchion. Let us know what you have in mind and we will present it to our manufacturers and fabricators to see if we can make it happen. The stanchions shown on the right are powder coated metal that appear to have a wood grain finish. USE: Mostly Indoors. Treatment for outdoor use may be available. Our powder coated rope stanchions are highly durable, add class and a professional look to any indoor setting be it a bank, hotel lobby, winery, upscale restaurant, resort casino or professional office building. 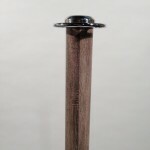 These high quality post and rope stanchions feature a metal post that has the appearance of a mahogany wood grain post. 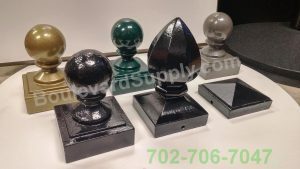 The bases and finials are available in a variety of finishes. 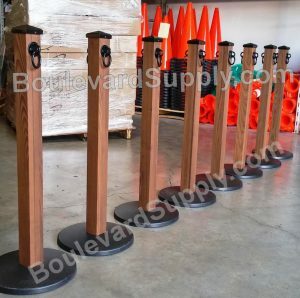 QUANTITY: How many stanchion posts will you need? 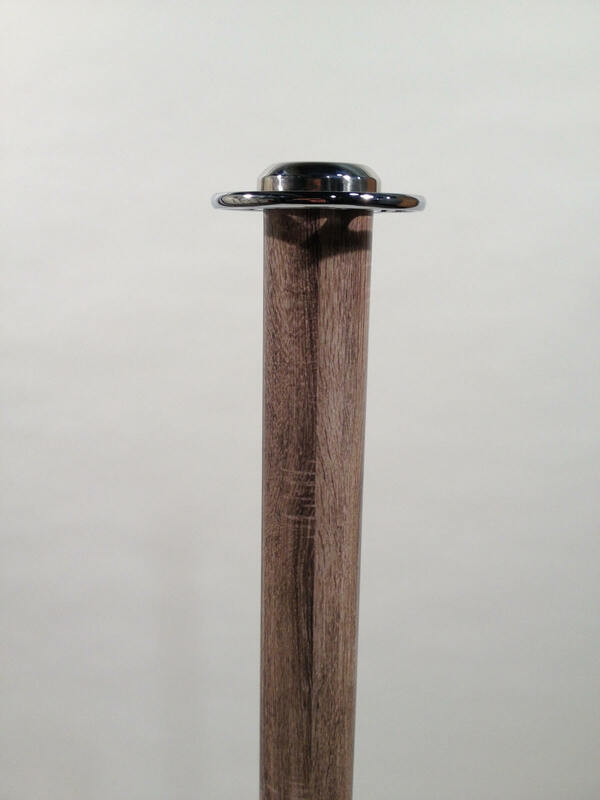 USAGE: Do you plan on using your wood stanchions indoors, outdoors on a limited basis or outdoors full time? BASE TYPE: Square or round? TOP CHOICE: Tapered top, smooth ball top, splined ball top? COLOR CHOICE: On the powder coated metal stanchions, your choice of wood grain color.